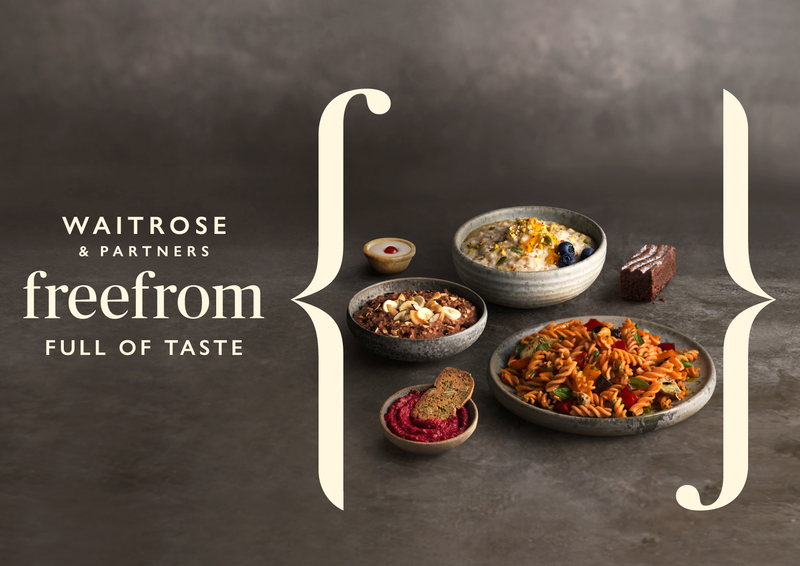 WMH has set out a new creative direction with the launch of Waitrose & Partners’ new Free From range, on sale in stores from 22nd October. 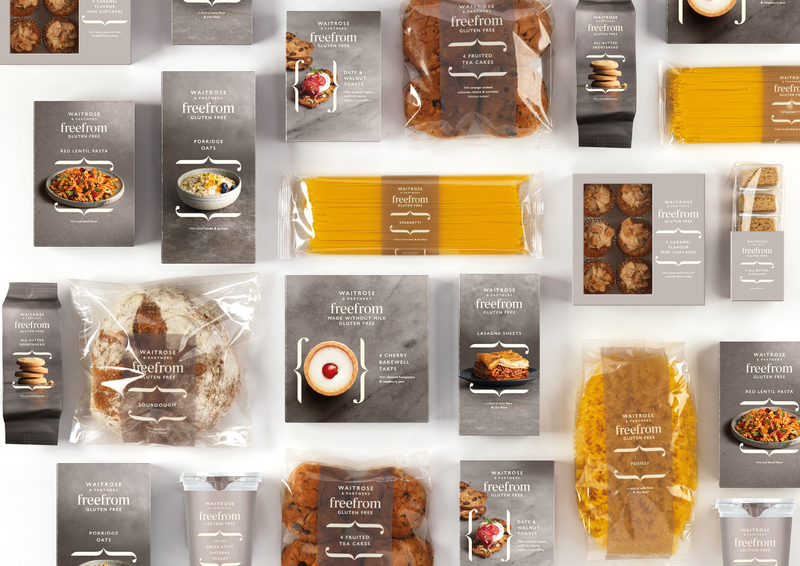 Free From is a completely new sub-brand concept within the Waitrose & Partners portfolio, and the first range to launch under the new “& Partners” banner, unveiled last month. The new design represents a shift in mindset for “free from” food, emphasising that the products are full of flavour instead of focusing solely on the removal of potential allergens such as gluten or lactose. Presented as a positive, progressive eating choice, regardless of whether you have allergies or not, the new Waitrose & Partners Free From range is designed to make shopping for “free from” foods easy and provide a wide range of delicious products. The Waitrose & Partners team came to WMH with a range of meticulously developed products, with extra care having been taken to ensure that products are free from allergens, but uncompromising on both the great taste and quality expected from Waitrose & Partners. This pride in the food formed the starting point for WMH when creating the brand idea; “Free From… Full of Taste”. The key visual mark is a pair of bespoke ‘f’s’ that double as typographic braces, framing the food. Sophisticated and simple typography communicates what makes these products so special. To hero the product, WMH also wanted an editorial-style approach to the photography. As such, it collaborated with award-winning photographer Jonathan Gregson, who brought the vision of “Full Of Taste” to life with an artistic flair. The stunning food photography – with its use of marble, zinc and ceramics – is combined with a refined colour palette of taupe grey and ivory. On packs where products are made visible with windows, the typography is used without photography. Being unified in tone, yet not always the same, gives the design a pace throughout the range. “We set out to create a visual identity that looked and behaved differently to the category more broadly, with a more positive, editorial approach. Reinforcing Waitrose & Partners’ position as a trusted expert in this growing category,” said Chris Ribet, lead creative at Williams Murray Hamm. This new brand will target two distinct audiences. The first is allergy sufferers, who make up 71 per cent of customers. The second is health seekers, expected to be a major source of future growth, as the new Free From branding and products broaden the appeal of the sector. Free From products are one of the fastest growing food categories, outperforming retail experts’ expectations to date. Its substantial growth is predicted to be £673 million in 2020, according to Mintel. Williams Murray Hamm’s branding ensures that all 40+ products in the range – which includes gluten-free lasagne, spaghetti, flapjacks and granola, and lactose-free halloumi, mozzarella and feta – are clearly labelled to show which allergens a product is free from.